Israel released a total of 1,027 male and female Palestinian prisoners in exchange for Shalit. Most of the prisoners returned to the West Bank. The rest - with the exception of a few prisoners who were transferred to Jordan – were released to Gaza. 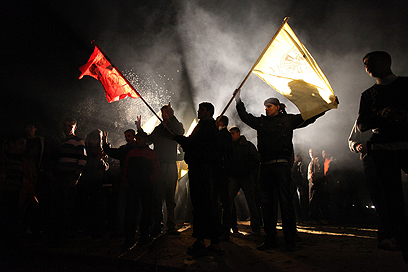 Meanwhile, some 2,000 people gathered at the Mukataa compound in Ramallah, where, along with Fatah leaders, they greeted the prisoners who arrived aboard dozens of buses. Prior to the reception, the Palestinian prisoners visited Yasser Arafat's tomb. Palestinian President Mahmoud Abbas was not on hand because he is visiting Turkey. During the rally in Ramallah, Tayeb Abdel Rahim, the Palestinian Authority's secretary-general, praised the reconciliation agreement between Hamas and Fatah. Hamas parliamentary Speaker Aziz Dweik, who also attended the rally, mentioned the Hamas MPs who were still imprisoned in Israel. "Every Palestinian deserves freedom, regardless of whether he is an MP or not," he told the crowd. In Gaza, Hamas spokesman Abu Obaida told a press conference following the completion of the Shalit deal "we've released 20% of the prisoners for one soldier. The Palestinian resistance's goal is to free all the prisoners from Israeli jails." The judges said in their ruling that the court does not intervene in the authorities' considerations, adding that it "should not determine whether it is preferable to release prisoners who belong to Hamas or those who belong to Fatah." On Thursday the court rejected a similar petition filed by terror victims' families. Defense establishment officials stressed that none of the 550 inmates who were released are affiliated with Hamas, and that none were defined as having "blood on their hands." However, the group of prisoners did include Salah Hamouri, who plotted to murder Rabba Ovadia Yosef, and Taltal Na'asan, a senior Force 17 member who was arrested in 2001 and confessed to taking part in shooting attacks and planning to plant bombs in the Ramallah region. Jaber Badr, a member of the Popular Front for the Liberation of Palestine who planned to carry out a suicide attack against Israel in 2007 as revenge for Israel's policies regarding the Temple Mount, was also released Sunday. See all talkbacks "Shalit deal completed: Another 550 prisoners freed"